The Birthday of Lord Ganesha is celebrated as Vinayaga Chathurthi. Every year we celebrate the festival by preparing the idol of Lord Ganesha with the help of IX and XI Std students. 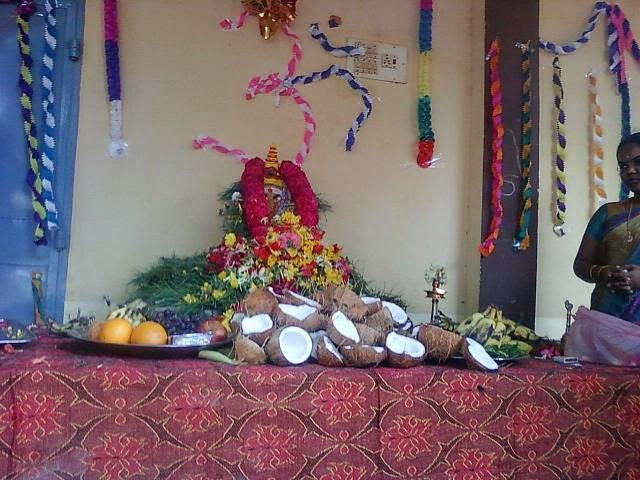 The vinayaga charthurthi celebration was celebrated from 27.08.2014 to 30.08.2014. Each class was given a chance to worship Lord Ganesha by offering flowers and prasadam. Students worshipped Lord Ganesha with Sastanga Namaskar and chanting Manthras. After completing the Pooja, prasatham was distributed to the students and staff. The last day Pooja was conducted by X & XII students in a grand manner on 30.08.2014. After completing the last day celebration of Vinayaga chathruthi, the idol of Lord Ganesha was taken by our students for Visarjanam. With the blessings of Lord Ganesha the ceremonies had been conducted very auspiciously.